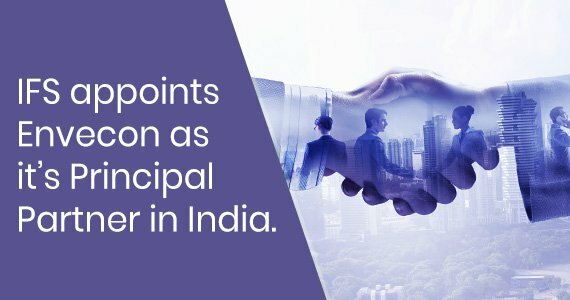 Delhi, India, March 25th, 2019 – Envecon, a leading global enterprise software services company, announces its appointment as IFS’s Principal Partner in India. In line with the appointment, Envecon will expand its workforce by 40% as part of its commitment to IFS throughout the region. This is to cater for existing customer demand and planned growth in the coming years. Stephen Keys, Regional President for IFS in Asia Pacific, Japan, Middle-East & Africa, added: “Customers are at the core of our business, both in the way that IFS solutions are built but also in how they are implemented and maintained. Envecon’s shared values, proven track record, and commitment to IFS demonstrate that they are a great partner for IFS to grow with. In turn, IFS will continue to give Envecon access to the resources they need to continue to delight our customers”. Envecon is a Global IFS Service and Channel Partner with 100+ successful implementations worldwide and a track record of delivering projects on time and within budget for clients. Envecon has become the trusted digitalization partner for their customers, providing IFS services for the last 8 years in more than 50 countries across Asia Pacific, Middle East, Africa, Europe and Americas. In 2018, Envecon was awarded the IFS Enterprise Services Partner of the Year award.